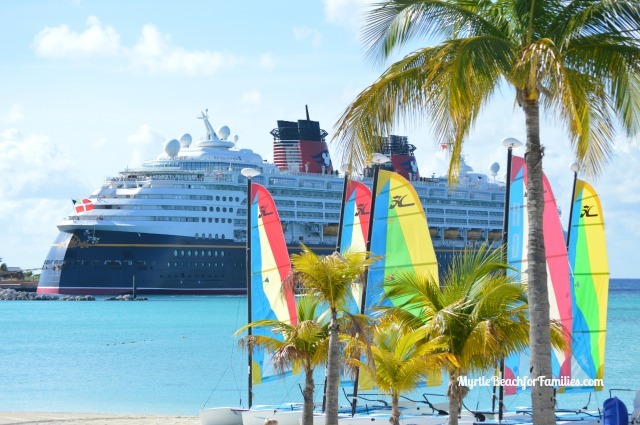 This post the sixth in a series about our Disney Cruise on the Wonder in October 2014. To check out the other posts in this series, click here. 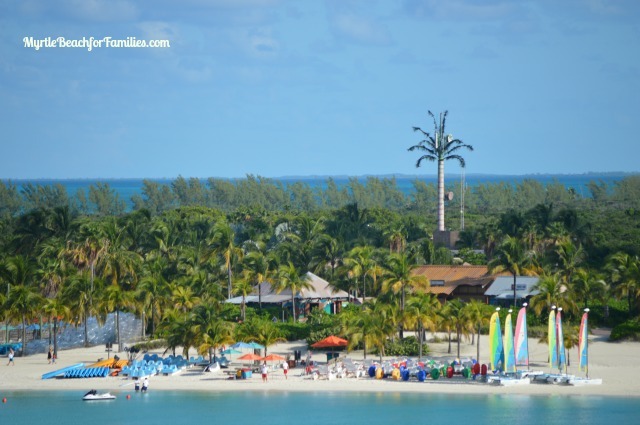 Days two and three of our Disney cruise on the Wonder were spent on Disney’s private island, Castaway Cay. It was this part of the itinerary that sold me on this cruise. I had a fantasy of sitting on a beach (yes, I know we can do that any old time here in the Grand Strand), have someone bring me beverages, not having to pack a cooler of peanut butter and jelly sandwiches, or having to cart chairs, an umbrella, towels, and toys. 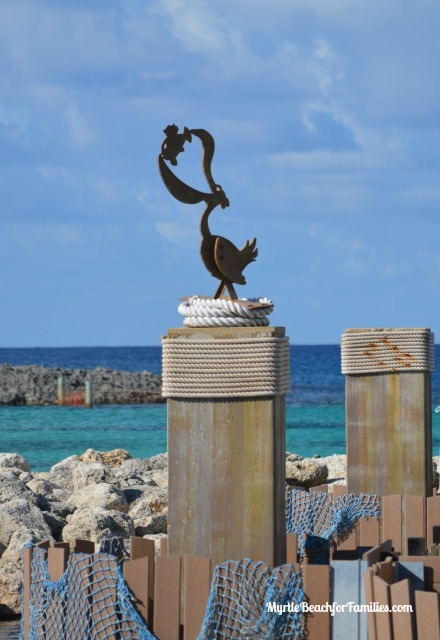 Castaway Cay completely delivered. On our first morning there we had a snorkeling excursion planned. While talking to a few people I had my doubts. We paid $55 per person to snorkel and a few people said the experience was basically the same in the lagoon with only a $6 equipment rental fee. We boarded the pontoon boat and the ride out to our location was about thirty minutes. We were on the other side of the island in the open ocean. We were in no lagoon. It goes without saying, but we were required to wear life jackets. A few people had conversations and went without them, but I found it made me feel much more secure. The scariest part was jumping off the boat. I made my husband go first. Then, when we first got in the water, it took me a good ten minutes to figure out the breathing and get my bearings. I was a little nervous, I won’t lie. But once I settled down it was AMAZING! We saw every color. Our time in the water was about 70 minutes and we were one of the last ones to get back on the boat. This excursion was well worth the money, but you do have the be comfortable with being in the ocean. If you’re nervous about fish being near you, save yourself the money. If you have anxiety about being in the water for that period of time, this isn’t for you. For the rest of that afternoon and the entire next day, we ate, drank, and were merry. 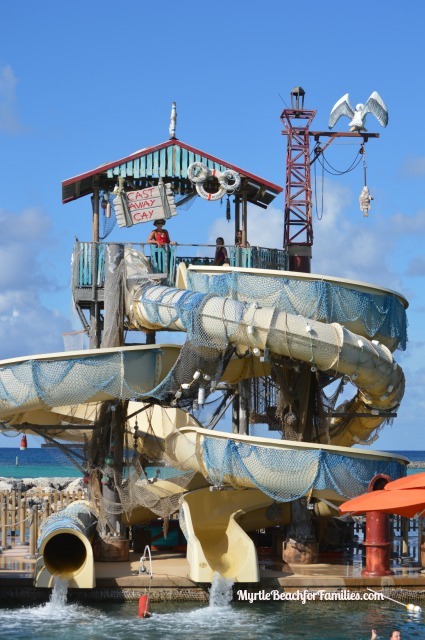 When we returned one of my daughters asked me how the family beach was and what types of activities they had. My answer was, “I have no idea.” We went directly to Serenity Bay adults-only beach and stayed there. It was glorious. Before leaving, I did snap a few shots of a few island features. 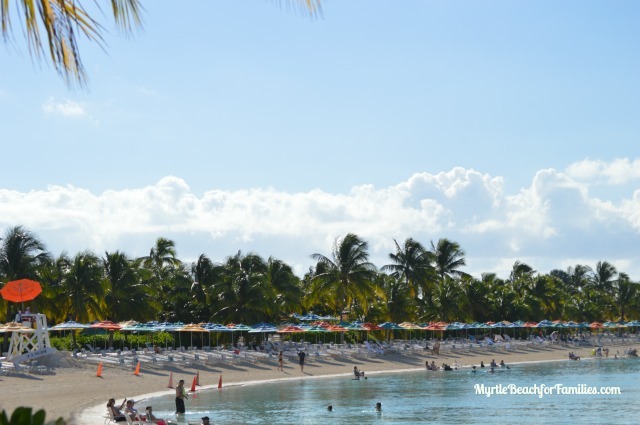 On our last day, we left the island and headed right to the adults-only pool, Quiet Cove, on the ship. The funny thing is that the ships’ horns are located just over it. Before the ship pulled out of port there was an announcement. “Attention! At the conclusion of this message, you may want to cover your ears.” Good advice.